This is a question for Julia since she claims serbian chetniks are only freedom fighters , and even today Serbia is only country in world who equal rights for Anti-Fachist fighters and chetniks from second World War. Julia Gorin is constantly trying to prove that Croatians are followers of ustasha movement from 1941 and they exist in current Croatia, which is false accusation because Croatia is democratic state and forbid all hate and anti-semit usage of any symbol. But as in USA or any other country there is always bad seeds who pull bad light to whole nation. But does it apply to Serbia ? Obviously not since chetnik party is well established party in today Serbia. But since Julia is always try to remind her readers some lies about Croatia here is also reminder where was serb chetniks in WW2 and to answer me this question : Who collaborate with Nazi's in Serbia? 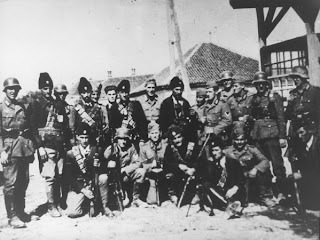 “As the Germans tired to have three of their V-maenner three out of 70 chetniks the NDH powers had arrested after the Otok massacre"
written on situation in Serbia during his visit to Belgrade in June 1944.
ibidem,p.187; BA/MA, RH 26-118/32 Befehl and die Cetnikfuehrer Cvijetin Todic,Golub Mitrovic,Savo Derikonja,Radivoj Kosoric,Bozo Plemic und Dusan Kovacevic (12.1.43). ibidem,p.307;BA/MA, RH 24-15/10 SS-Freiw.-Div. “Prinz Eugen” an Gen.Kdo. XV.Geb.AK. (5.9.1943). Modern groups claiming to be Chetniks fought as paramilitary units in the Yugoslav wars with the stated goal of amputating territory from Croatia and Bosnia and Herzegovina. They invoked the Greater Serbia ideology. 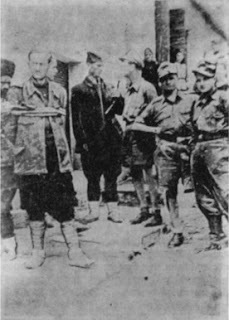 Šešelj organized the modern Chetnik movement into several paramilitary units, including the "White Eagles" and "Srpski Četnički Pokret" who fought in the Yugoslav Wars which had been linked to several attrocities including Voćin and Vukovar massacres. Serbian parliament has passed a law granting pensions to members of the Serbian Chetnik movement, the followers of the Serbian king who fled to London just before World War II. 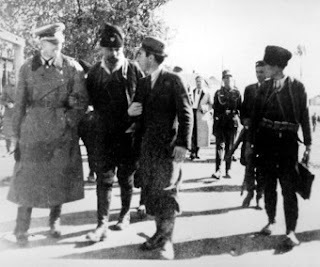 Bosnian born Chetnik commander Draza Mihailovich revived the paramilitary units and their trademark long beards to fight the Nazis in World War II, but later changed sides to back the brutal Nazi occupation. So Julia please do answer who have Nazi followers state Croatia or Serbia? What a crap of lies.You want to turn around history but this is not poossible. Yes the Chetniks where a half or one year colaborators but only to fight against the comunists. It is known that in the Chetniks legions where also croats and bosniaks. It is also known that 90% of villages and citys where liberated by chetniks and not by partizans. Why do you not write about the mission "high jump" where the chetniks save over 500 Amerikan pilots and the support by England in the beginning of ww2! Everybody knows who was bloodest murderers an allys of Nazis in ww2! It was the nazi puppet state of Croatia called NDH and their bloody ustashas who killed who knows how much inocent people, sure over a half million only Serbs where killed by them. The bosniaks and their cruel hangar division also have their bloody part against Serbs in ww2 and know when i read so much lies like this, than i think only what idiot can write something like this. Its pure propaganda against Serbs. But the best facts and proof of that who is a Nazi state and follower of their belives you can see from 1940 to now in modern Croatia where the people of Croatia celebrate the Nazis until now. Just look what the jew Efraim Zurof say about Croatia. Also you can see thousands of photos on google images about the crimes of ustashas and the Croats. Crimes against children and woman but not only, just look on Youtube and Google and how much facts and Photos you have about the claims that the Serbs and chetniks where Nazi puppets? Maybe 20? So please lie to some dumb people but not to somebody who knows the truth. Professor Sabrina Ramet, a historian, has observed, "Both the Chetniks' political program and the extent of their collaboration have been amply, even voluminously, documented; it is more than a bit disappointing, thus, that people can still be found who believe that the Chetniks were doing anything besides attempting to realize a vision of an ethnically homogeneous Greater Serbian state, which they intended to advance, in the short run, by a policy of collaboration with the Axis forces". They did the same atrocities as in Balkan wars, WW1, WW2 and Greater Serbian war in 1990's. I suggest anyone interested in this topic to read: "Heavenly Serbia: From Myth to Genocide"